I've tried but blogger wouldn't play and my Internet connection has been somewhat patchy too. 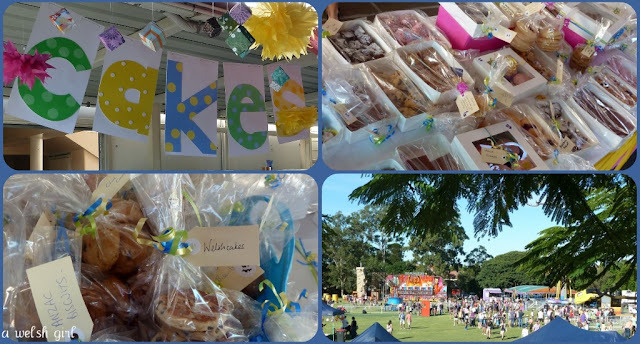 Last Saturday was school fete day. I think they should re-name it school fete month! School fete (or Summer Fair as it was known when I was younger) used to be a few stalls selling home made cakes, second hand books and toys, a bran tub with little cheap gifts and maybe some candy floss or ice cream. Here, the school fete has a life of its own. There is a convening committee, individual stall conveners with folders and files of information , parents, grandparents etc making hundreds of jams, cakes, biscuits, sweets, painting, organising and generally working very hard! We (and it was a team effort in this house) made buckets full of apple and blueberry jam, some red onion chutney and 200+ Welshcakes. I prepared the Welshcakes in the kitchen, Sibs was the transporter to the bbq outside where Neil was cooking. After about an hour of this I had finished my part and went outside to view the efforts...it was dark by this time...there were no lights on...the Welshcakes were burnt! Some were completely black and had been put in a "for us" pile. On closer inspection about 70 of the 100 were too burnt to sell at the fete! "At least you won't have to make Welshcakes for us for a while" said Sibs. Neil (sensibly) stayed very quiet and quietly got on with clearing up. Later on he offered to help with jam making and wasn't too surprised when I told him that I could manage very well by myself thank you...even it did mean staying up until midnight! Our freezer is now well stocked with blackened Welshcakes! So fete day was pretty hectic and the kids had an absolute ball. Sibs was allowed to roam with her friends and they loved the freedom and independence. From last year's experience of being spent out by 9.30am, we rationed her money throughout the day. Every time I saw her she had a grin from ear to ear and something sweet in her hand. I spent most of the day helping out with the cake stall and Neil did his bit as MC. That evening I left my lovelies at home with some friends and went out to celebrate a birthday with a friend. After a few hours in a rather trendy place in Paddington we couldn't hear ourselves think let alone speak so we ventured to a quieter bar. It was full (so the doorman said). We think that a group of six mothers who had been busy baking, organising and generally working silly for a few weeks didn't quite hit the look of the clientele that they were after on a Saturday night!! Funny thing was, each one of us was more than happy to call it a night and head home for a cuppa! Yikees, that says a lot! Sunday was Mother's Day here and it was also dads and kids clean up morning at the school. This meant a glorious lie in for me. We lazed around and then headed down to the river late afternoon and watched an open air movie. No prizes for guessing what movie we enjoyed whilst lying down under the stars huddled under blankets. Ha Beth! I feel for you re: the tanned cakes. All this multi-tasking bizzo can get so... where was I? 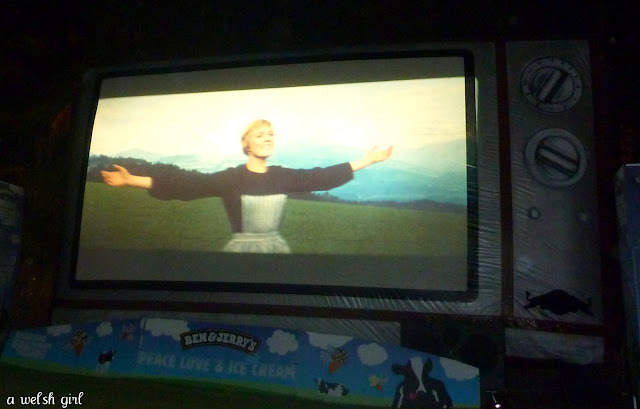 Oht that's right, the hills are alive with the sound of music. School Fetes?! I hear you! Big business!!! One thing is the kids all seem to have a ball these days, even if it does bleed thy parents dry.